Around this portion of year, people waste time blowing smoke up their own butts about New Year’s resolutions they will never complete. People join a new gym they will never go to. They tell their friends they are going to work out and lose weight, but then they will spend the next 365 days sucking down venti-sized mochas topped with whipped cream. That pack of lies and hypocrisy won’t be me this year. Well, I will be sucking down those venti mochas, but what I won’t be doing is denying it. This year, I am making peace with who I am, and my New Year’s resolutions will be realistic goals I can easily achieve. First and foremost, in 2012 I will drink more beer. Just by adjusting my New Year’s resolution, I am really looking forward to this year. It’s going to be great and full of personal success. If my son wants to spend his weekend playing Xbox for 48 hours straight, or my daughter wants to see how much makeup a single human face can hold up at once, that is part of the learning experience. This year I’d like to be a more well-rounded and worldly person. The first step to doing that is drinking more than just my usual favorite Mexican beers. I need to branch out and drink German and Japanese beers too. To make myself a better person this year, I am going to drink as much beer from around the globe as possible. As a secondary goal, I am also going to break my annual trips to the urinal record. To continue bettering myself, I want to further my education this year. The best way to do that is by watching more television. Yes, my resolution is to watch more TV. Ice Road Truckers, Jersey Shore, and Pawn Stars—these are wonderful tales of Americana, and I need to spend more time sitting on the couch absorbing all of the vast knowledge from these great shows. Some critics say that TV makes people dumb. I learned that statistic on TV, so who’s dumb now? I want to be better to the environment and use fewer chemicals, less soap, and less water next year. That means I will wear my clothes longer before washing them. I vow to wear a pair of jeans for a solid week before putting them into the laundry. This is a win-win, since I will be using less of the Earth’s resources and creating less laundry work for my wife, whom I love. In the new year, I’m going to let my kids grow and earn some independence. Instead of coddling my kids, I am going to let them fly free. If my son wants to spend his weekend playing Xbox for 48 hours straight, or my daughter wants to see how much makeup a single human face can hold up at once, that is part of the learning experience. Sure, my son may damage his eyes and my daughter might be mistaken for Bozo the Clown, but by engaging them and setting rules for them, I am just holding them back. They need to learn from their mistakes. Plus, I’ll be too busy drinking Japanese beers, wearing dirty jeans, and watching Pawn Stars to tell them not to stay up all night posting pictures on Facebook of their recent clown make-up disasters. I am going to stimulate the economy. Paying off debt, saving money, and not utilizing credit never helped anybody. Society wants me to go out and buy stuff I don’t need with money I don’t have. It is an American tradition. I am going to go to the mall, walk around until I find a new glow-in-the-dark beer pong table (that’s just a little bit different from the perfectly good beer pong table I already own) and buy it on credit because merchants need to eat, too. It is my duty as a citizen to buy this stupid stuff on credit. I am buying beer pong tables to save the country. Obama would be so proud. I am also going to take care of myself physically this year. That doesn’t mean I’m going to waste money on a gym membership and lower myself on the evolutionary chain from homo sapien to gerbil by running in place and sucking on a water bottle. Instead, it means this year, when my body is telling me something, I am going to listen. When I’m full, I’ll stop eating. Conversely, if my body wants to get rid of something, I’m going to let it fly. Therefore I will not hold in my flatulence during 2012. Farting begins with the letter F, just like the word freedom. Along the lines of taking care of my body in the new year, I am going to watch what I eat. I am going to watch myself eat red meat. I am going to watch myself eat candy bars. I am going to watch myself eat 13 donuts, because a baker’s dozen is one better than 12. I’m tired of everyone making food out to be the world’s No. 1 enemy. Food keeps us all alive. I like life, I want to live lots, therefore I’m going to eat lots. More is better. 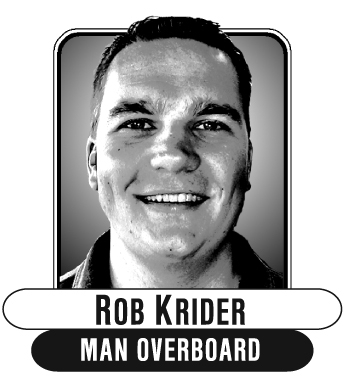 On New Year’s Day, Rob achieved all of his resolutions when he farted into a dirty pair of jeans as he chased a donut with an imported beer, ignored his kids, and watched a six-hour Ice Road Truckers marathon on an expensive TV.